Find out a bit more about the students taking part in the CARER programme this academic year…. My name is Ella and I’m one of the students heading out to Bangor in September to take part in CARER. This first post is a little introduction about me – my hobbies and interests, why I chose to take part in CARER and what I hope to gain from the year! So.. first the basics. As I said my name is Ella, I’m 21 and I come from a village in East Sussex called Forest Row. I love the outdoors and really enjoy things like hiking and camping. I like doing crafty things like sewing and knitting. I also like volunteering, for example I have been a Beaver Scout Leader at home and in Cardiff, and at uni I have been involved in Teddy Bear Hospital and Sexpression. As well as all of this I also love lazy days and I really like watching films! I decided to take part in CARER because I thought that it would be nice to have a change and move away from Cardiff for a year! I have liked the GP teaching I’ve had in the past 2 years, and I thought that one on one teaching with a GP would be a fantastic learning opportunity that would really benefit me. I am looking forwards to meeting lots of patients and really getting to know them, as well as getting involved in a rural GP practice! I am also excited to live in Bangor. I am looking forwards to going hiking in Snowdonia and I am definitely considering joining the hiking society at Bangor University! I am definitely going to join some other societies as well, and I am planning to find a Scouts group to try and continue volunteering as a Beaver Scout leader. 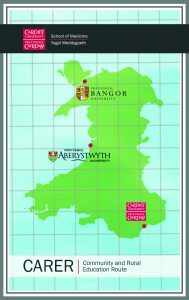 Also some of my friends from Cardiff will be coming up to Bangor for a couple of placements, and I am really excited to show them around! Overall I think it will be a great year, and I am really looking forwards to sharing it with you! Hello I’m Jomcy. I am very excited to embark on this new challenge with the CARER programme. Learning alongside more senior doctors with one to one teaching seemed invaluable, motivating me to sign up for this new programme. Moreover, being in a GP setting for the year will expose me to larger number and variety of patients, which will exponentially improve my learning. I am originally from Cardiff and enjoy getting involved with the outdoors, making Bangor the perfect location. My favorite social media platform would be Facebook simply because it’s the one I have gotten most used to using regularly. I also enjoy wasting plenty of time on Youtube, so I guess that too in on the list. Hi, my name is Ellen and I am from Somerset. I really enjoy being outside, taking photos and settling down after a long day with a fabulous documentary and a bag of popcorn! I was keen to be involved in the CARER project as the thought of being back in the countryside excited me. I also thought it would be an excellent opportunity to be working with patients where the majority of healthcare takes place – in the community. I want to learn more about North Wales, the role of GP’s and develop my clinical diagnostic reasoning. I would like to learn some welsh, explore the beaches and hopefully get up Snowdon somehow! I am so excited for the year and looking forward to sharing our journey. Hi, my name is Ed – I’m one of the Year 3 students involved in the CARER pilot and am part of the Aberystwyth team. Hi my name is Chloe and I’m from East London. This is a little bit about why I want to do the CARER project and what I’m looking forward to. I have decided to take part in the CARER project because I’ve had excellent teaching from my GP placements during my 1st and 2nd years. I think it’s going to be very beneficial having a one to one mentor for the whole year. I think it will give me a fantastic opportunity to learn from a patient centered approach and I will have plenty of opportunity to take histories and complete examinations. I am looking forward to having a year away from Cardiff and exploring a new city. Some of the things I want to do this year is to climb Snowden and have a go on the zip wire at penrhyn quarry which is the fastest in the world! I also want to explore and make the most out of living in North Wales. I’m also looking to vlog the whole experience and can’t wait to start! !